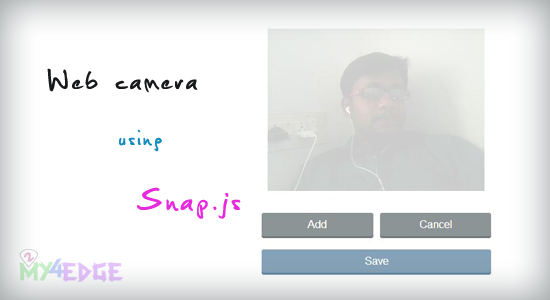 After a long time, i'm going to tell you about web camera snapping, photo snapping in web camera and mobile camera is now people are early searching, so here i'm going to show you the simple photo snapping Jquery code. it support all kind of cross browsers, and it is very light weighted Jquery for web camera snapping in a single click. let see the simple code to use it. this is very simple code and light weighted code, you can take photo from any of the device using this code and you can upload it to any of the server. the highlighted scripts are very important script and those scripts are very lightweighted and simple to support all cross platform browsers. check the demo, i hope it will be very helpful and useful to you. thank you. Totally hilarious...this is more of a image upload script. It's quite good for what it is, but it's an upload script. Add a responsivity factor to it, then it can be offered to mobile users to upload their phone images with. But how can i save it to a database?